This rugged direct-reading flowmeter monitors air flow rates to determine optimum performance, flow regulator settings, or pneumatic system performance. It is intended for use in mobile or industrial pneumatic systems as well as air power-operated hand tool systems. 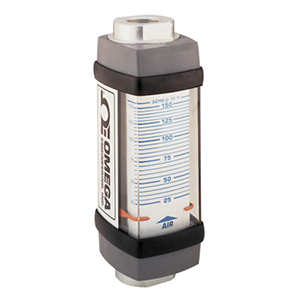 These flowmeters feature direct reading scales for air flow and are available in a wide variety of flow ranges. 참고: Comes complete with operators manual. For British standard pipe thread parallel, add suffix "-BSPP" to model number, no additional cost. For NIST traceable certificate, add suffix "-NIST" to model number, add $300 to price.